COMPANY PROFILE Oriental Bank of Commerce is a commercial bank. It offers various banking products and services in India. The Company’s business segments include treasury operations, corporate/wholesale banking, retail banking and other banking business operations. Oriental Bank of Commerce is an India based commercial bank. It offers various banking products and services in India. The company’s operation includes treasury operations, corporate/wholesale banking, retail banking and other banking business operations. Treasury operations consist of dealing with securities and Money Market Operations. Corporate / Wholesale Banking: Includes all advances to trusts, partnership firms, companies and statutory bodies which are not included in ‘Retail Banking’. Retail Banking is offered to individual, HUF, Partnership firm, Trust, Private Ltd. Companies, public ltd. Companies, Co-operative societies and among others or to a small. 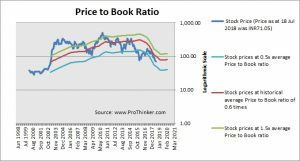 At the price of INR71.05 as at 18 Jul 2018, Oriental Bank Of Commerce is trading at a Price to Book Ratio of 0.4 times current book value. 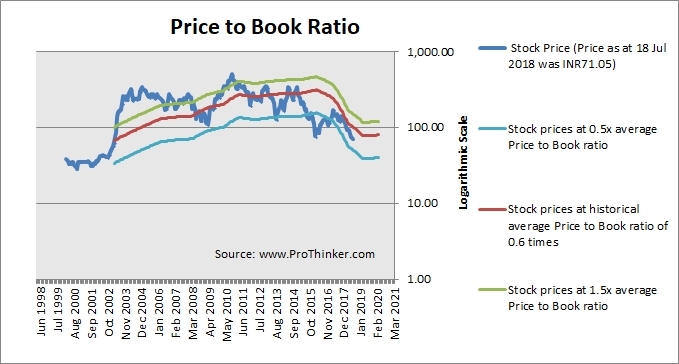 This is a 30% discount to its historical average Price to Book Ratio of 0.6 times.